I know the title sounds a bit weird and you may ask why would you need to recover a RAID5 array when all your disks are healthy, right? The Errata AVR54 of the C2000 Specifications update clearly states the following: “system may experience inability to boot or may cease operation”. My NAS was starting to have regular reboots and it completely crashed before I could back up the last delta of data. In the first instance, Synology denied any abnormal failure rate on this specific hardware while admitting a flaw (!). 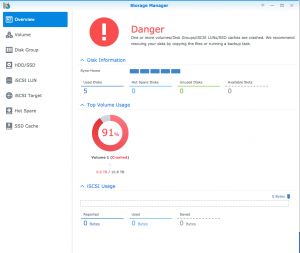 Synology then extended the warranty of all the NAS platforms affected by this hardware flaw. I immediately opened a case with Synology who sent me another DS1515+ pretty quickly. I still had to pay for express shipping). 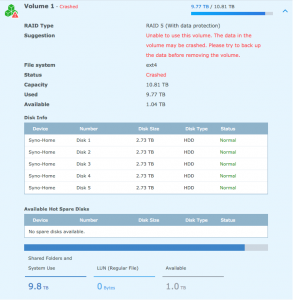 After I inserted my disks into the newly received NAS, I noticed that the new NAS was beeping and was trying to recover my RAID5 array without any luck. 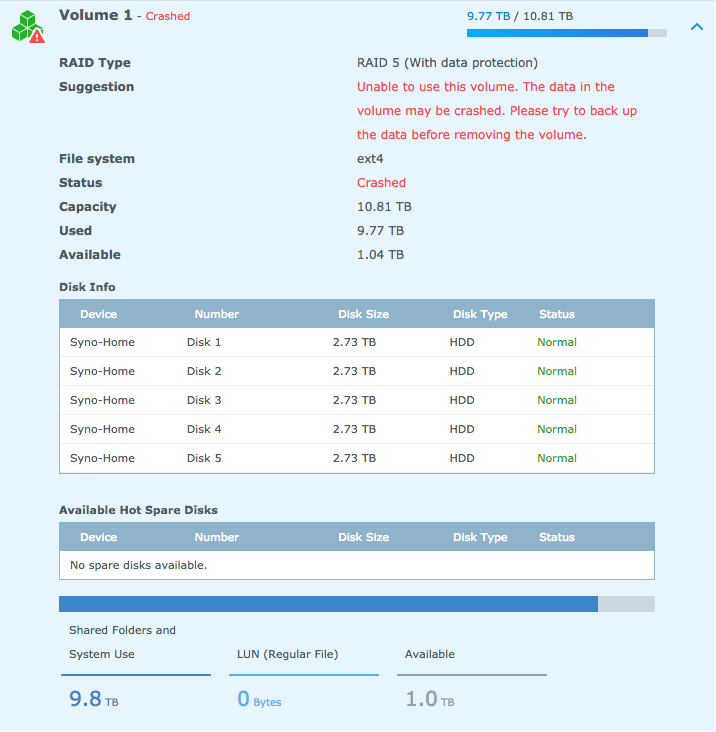 The DSM told me that the Raid 5 array was down but all disks healthy. I waited until the parity check was performed to verify if the Synology was silently trying to recover the volume. Unfortunately after 10 hours, nothing appeared in my volume list. I decided to dig and found plenty of useful information provided by Linux experts in the Synology community (shootout to him/her). The partitions were good when I ran an fdisk -l so I tried to stop and reassemble the RAID 5 array. ash-4.3# mdadm --stop /dev/md2 mdadm: stopped /dev/md2 ash-4.3# mdadm --assemble --force --run /dev/md2 /dev/sda3 /dev/sdb3 /dev/sdc3 /dev/sdd3 /dev/sde3 -v mdadm: looking for devices for /dev/md2 mdadm: /dev/sda3 is identified as a member of /dev/md2, slot 0. mdadm: /dev/sdb3 is identified as a member of /dev/md2, slot 1. mdadm: /dev/sdc3 is identified as a member of /dev/md2, slot 2. mdadm: /dev/sdd3 is identified as a member of /dev/md2, slot 3. mdadm: /dev/sde3 is identified as a member of /dev/md2, slot 4. mdadm: added /dev/sdb3 to /dev/md2 as 1 mdadm: added /dev/sdc3 to /dev/md2 as 2 mdadm: added /dev/sdd3 to /dev/md2 as 3 mdadm: added /dev/sde3 to /dev/md2 as 4 mdadm: added /dev/sda3 to /dev/md2 as 0 mdadm: /dev/md2 has been started with 5 drives. mdadm: /dev/sda3 is identified as a member of /dev/md2, slot 0.
mdadm: /dev/sdb3 is identified as a member of /dev/md2, slot 1.
mdadm: /dev/sdc3 is identified as a member of /dev/md2, slot 2.
mdadm: /dev/sdd3 is identified as a member of /dev/md2, slot 3.
mdadm: /dev/sde3 is identified as a member of /dev/md2, slot 4.
mdadm: /dev/md2 has been started with 5 drives. [ 4409.774205] JBD2: journal transaction 23508701 on md2-8 is corrupt. AH ! The journal has an issue when loading so let’s try to mount it and load the journal. (Do not plan to do that for a long-term use of your NAS, my immediate concern was data recovery). I could see my folders (some names are changes for obvious privacy reasons) but I was wondering how to retrieve my data now …. the GUI couldn’t see a volume and I couldn’t install any package on the volume in the GUI (because it didn’t see any)…… So I couldn’t FTP at all. So I had another empty box with Linux running on it and I decided to do some Rsync backup from the old NAS (failed volume) to another NAS. ash-4.3# rsync -gloptruv /volume1/yyyy/ admin@IP:/volume1/Backup The authenticity of host 'IP (IP)' can't be established. ECDSA key fingerprint is SHA256:SHA256ASH:) Are you sure you want to continue connecting (yes/no)? yes Warning: Permanently added 'IP' (ECDSA) to the list of known hosts. admin@IP's password: Could not chdir to home directory /var/services/homes/admin: No such file or directory sending incremental file list .file. .file. .file. .file. .file. .file. .file. .file. .file. .file. .file. The authenticity of host 'IP (IP)' can't be established. Warning: Permanently added 'IP' (ECDSA) to the list of known hosts. I am so happy I retrieved the delta of data and learned from my mistakes. I need to automate the backup more frequently and on one more that 1 device. Now I just have to wait until I could copy a few TB of datas. Most of the course I tried about Linux were not reaching the expectation I had, I was quickly bored even though I had to keep watching/reading to understand everything. On this case I did prefer to dig the technology by reading articles and get my hands very dirty.